My undergrad thesis argued that world-building wasn’t just for fantasy and sci-fi writers—every tale has a setting, every tale creates a world in the reader’s mind—and it explored ways that drawing that world (visual thinking!) can lead to better fiction. 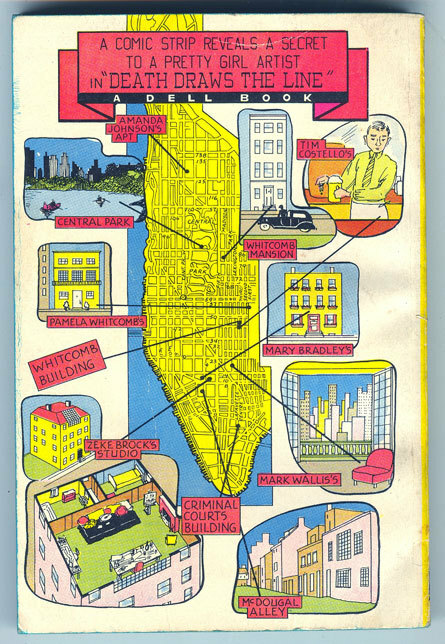 Some of my favorite “lit’ry” books are accompanied by maps. Some writers use previously-made maps to help create their fiction: Melville used whaling charts, Joyce used Ordnance surveys of Dublin, and Pynchon used aerial maps. Poking around the ‘net I found maps for Faulkner’s books, Treasure Island, and of course, Tolkien. What other favorite books of yours include maps? Let’s get a big ol’ list going in the comments! William Faulkner. 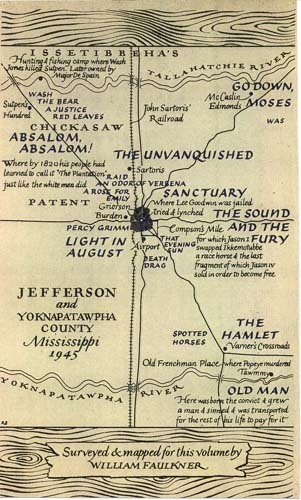 [Map of Yoknapatawpha County] from The Portable Faulkner (New York: The Viking Press, 1946). The Marauder’s Map in Harry Potter, even though we don’t see it (until the movie version), I imagined it well. I also feel like there should be a map or that there is an implied map in Neil Gaiman’s “American Gods”, because the geography of the book is so detailed. I was living in the Midwest while reading it and was familiar enough with the places and the routes that it feel like it was mapped out in my head. which sometimes includes fictional maps based on real places. 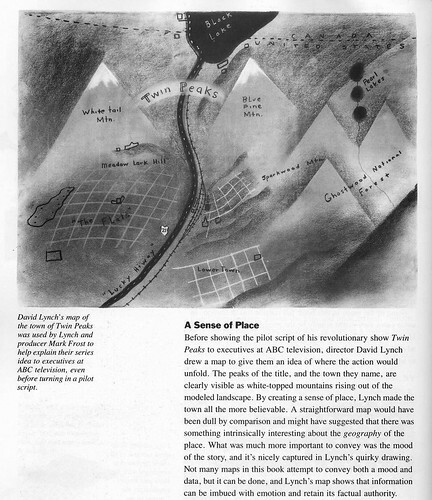 If you haven’t already found it, check out Maps of the Imagination: The Writer as Cartographer by Peter Turchi, a writer from, of all places, my high school. And Steven: can’t believe I forgot to mention Turchi’s book. I read that RIGHT AFTER I wrote my thesis. Highly recommended! It falls into the fantasy / children’s book realm, but the one that I really sunk into as a kid was The Phantom Tollbooth. It had the requisite Tolkien-style map, but something about the wordplay and thoughtful humor resonated with me. I can’t seem to find a copy of the map online, but it’s a reminder that I should re-read the Tollbooth. I wonder if it holds up as an adult? 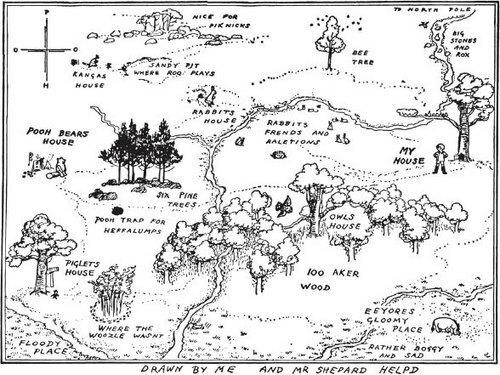 Maps of fictional worlds drawn by someone other than the author could be an interesting thing to look at, too. I used to have the “Atlas of Middle-Earth” drawn by cartographer Karen Wynn Fonstad (she also did coffee table atlases for the derivative Dragonlance and Pern series). It’s a testament to Tolkien’s level of detail (and prolific note-taking) that accurate maps could be drawn of his lands without straying far from the source material. 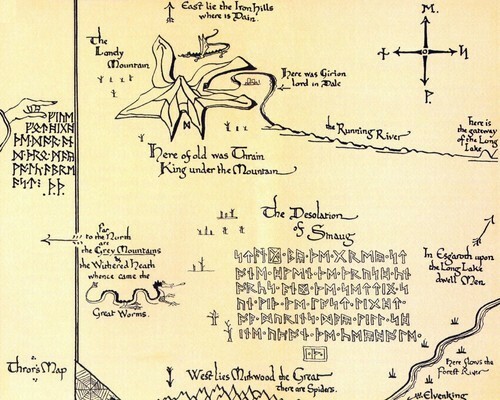 I read somewhere that Tolkien didn’t have his story for the Hobbit until he drew Thror’s map. As he continued to add detail, his plot ideas became clearer. Drawing a map can definitely be a good way to generate a story, as anyone who’s ever rolled a d20 can tell you. One of my favorite books is “The Dictionary of Imaginary Places” by Alberto Manguel and Gianni Guadalupi. It’s a reference book that includes imaginary terrains from Homer’s Land of the Lotus Eaters to Oz to Flatland to Harry Potter’s Hogwarts. There are “no heavens or hells, no places in the future, none outside the planet Earth, no pseudonymous places such as Wessex or Manawaka.” Each place is described in detail as if it physically existed outside the reader’s imagination and (the best part!) includes detailed maps. I come from a map family. Roadtrips. Camping. Learning. And when D&D came out, mapping gained a whole new life, a center point for the fluid role-playing of a diverse group of teenagers. We’re talking Middle School in the 70s. When there wasn’t a map provided, we craved it. We made our own. And we ripped content from Tolkien, Zelazny, anybody. When I reengaged with role-playing, it was because my future wife and our college friends were into it. My wife creates detailed lush worlds… and there are always maps. Her games were epic runs over months. I have run a few games, but I am more cinematic in style and improvisational in effort… and thus those games worked for one night. But without the mapping/detail that basis… they never sustained. Maybe I should say most accurately, I love other people’s maps. Traci… very cool book. I see a surprise gift in my wife’s future. Also: haven’t responded to Adam, yet…that’s so great that Tolkien couldn’t write it until he drew the map. How perfect. Thomas the Tank Engine is set on the Island of Sodor. The author, Rev. W. Awdry, used the London Underground map as a guide.Funnily enough, the discovery of this map led to all my other interests in cartography, psychogeography and so on. Here’s a cool hand-drawn one..
Wigwag Magazine was an offshoot of The New Yorker in 1989. They asked people to make maps of their lives. 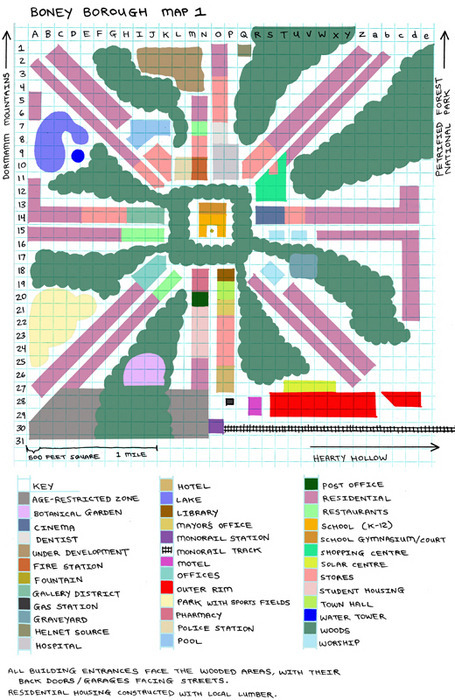 I put one on my blog; it links to a gallery of 10 more maps that were published in 1990 and 1991. Not so much a literary tool, but a theatrical storytelling tool (and applicable to my last week of re-viewing all the movies): Indiana Jones maps! The red lines traveling all across the pre-WWII era globe. 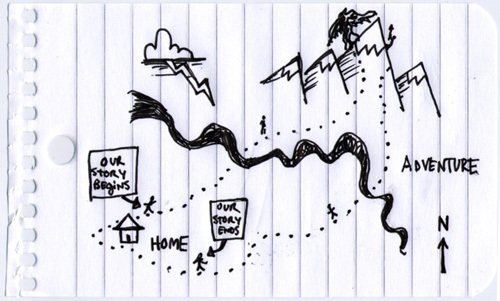 AND, the basic “treasure map” style of the stories. Occasionally we see an actual map (Indy’s dad’s hand drawn maps connecting clues about the location of the Grail), but the whole time we hear about where the characters are going, which direction they travel, or where someone/something is located. Even in “Temple”, we hear about how far they are and which direction they need to travel to Delhi. Excellent example, mon frere. I should point out that Dr. Jones Sr’s grail diary made me want to keep one. Terry Pratchett’s Discworld, there is even a map over “Death’s domain”. A place created from Death’s perception of humanity and human life, when he himself is portrayed as the anthropomorphic version of death. 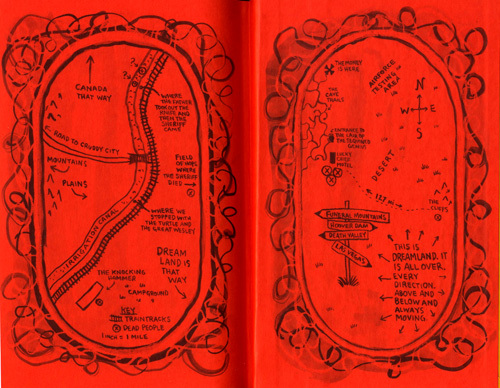 Gotta throw a recommendation in here for PRAIRYERTH: A DEEP MAP, by William Least Heat Moon. Thanks again y’all for all the great recommendations! Secret Water, by Arthur Ransome, is a book about some young explorers making a map. The medioeval secret library which doubles as a map of the world from Humbrto Eco’s The Name of the Rose. A map on the back cover of a dime novel! I immediately thought of Gregory Maguire’s Wicked, which has an awesome map in the front of the book that makes it a lot easier to follow the story geographically, since the characters can’t seem to stay in one place for more than a few chapters. if you desire to know the true location of atlantis and mu then go to atlantisdiscoverysite.com it is a pinpoint new map with photo,coordinates of the main islands of atlantis and mu….it is a brand new discovery and matches platos description with absolute accuracy….does any one really believe that one of the greatest philosophers of all time didnt know east from west?? its not in the mediteranean!! its right where plato said it was!!! Fantasy maps for sale. I quite enjoy these, similar to Pooh map. Great website you have, sir! PS, Lynda Barry is the best! I took her workshop “Writing the Unthinkable” (her book “What It Is” covers much of the same territory). If you ever have the opportunity to take the workshop I recommend that you seize it! I found it to be absolutely transformative and inspiring! Lynda Barry rules!! If you want can show them in your site, be grateful. 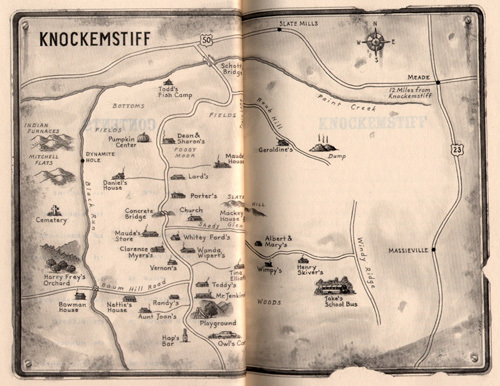 Robin Hobb’s trilogies have maps. The map also serves another important purpose in Treasure Island: it is a device Stevenson uses for storytelling. The reader can return to it again and again to point to various locales and to trace events as they unfold. Here is where the Hispaniola anchors, just off Skeleton Island. There is the stockade where the gentlemen take refuge to fight off attacks by the pirates, who have stupidly camped near the adjoining and pestilential swamp which is over there. Here is where Ben Gunn’s coracle can be found near White Rock; and when Jim takes it and travels out to the Hispaniola to cut the ship free from its moorings, he drifts this way, along the western side of the island, past the Cape of Woods while Jim struggles with Israel Hands—finally killing him and then beaching the Hispaniola at North Inlet over there at the top of the map. And here, of course, are three crosses that mark where the treasure is buried.